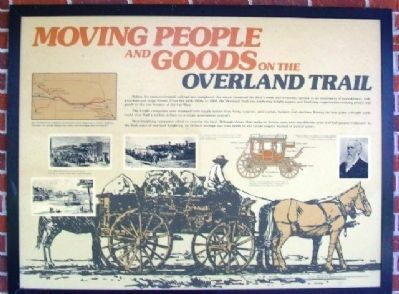 Moving People and Goods on the Overland Trail. —. Before the transcontinental railroad was completed, the nation entrusted the West's trade and economic survival to an assortment of muleskinners, bullwhackers and stage drivers. From the early 1850s to 1869, the Overland Trail saw lumbering freight wagons and bouncing stagecoaches carrying people and goods to the new frontier of the Far West. 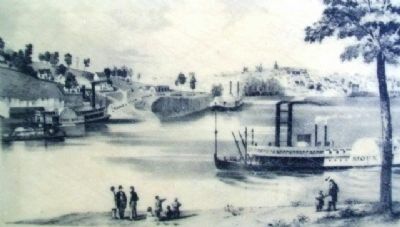 The freight companies were swamped with supply orders from Army outposts, gold camps, farmers and ranchers. During the best years, a freight outfit could clear half a million dollars on a single-government contract. Most freighting companies relied on oxen for the haul. Although slower than mules or horses, oxen were one-fifth the price and had greater endurance. In the final years of overland freighting, an ill-fated attempt was even made to use steam wagons instead of animal power. [Image captions read] . [Map] The Overland Trail combined several feeder routes, beginning in Omaha, Bellevue, Nebraska City and the Kansas river towns, and converging near Fort Kearny. 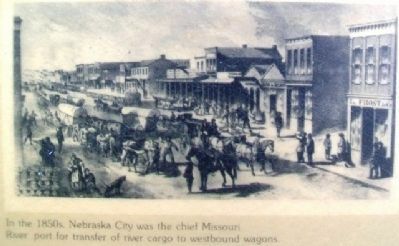 In the 1850s, Nebraska City was the chief Missouri River port for transfer of river cargo to westbound wagons. The completion of the transcontinental railroad in 1869 quickly brought an end to the long-haul freight business on the Overland Trail. Alexander Majors was a partner in the largest freighting firm on the plains - Russell, Majors, and Waddell. The firm later operated the Pony Express. 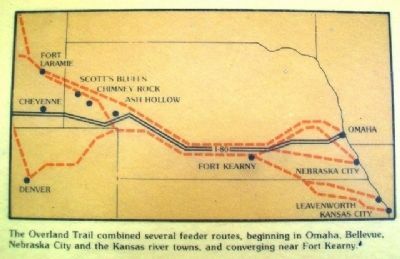 [Map] The Overland Trail combined several feeder routes, beginning in Omaha, Bellevue, Nebraska City and the Kansas river towns, and converging near Fort Kearny. completion of the transcontinental railroad in 1869 quickly brought an end to the long-haul freight business on the Overland Trail. 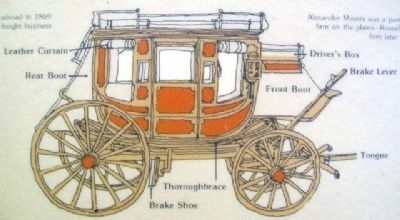 Although the Concord stagecoach was later called the "limousine of the Overland Trail," it was cramped and uncomfortable on the rough trails of the West. Marker series. This marker is included in the Overland Trail marker series. Location. 40° 49.367′ N, 97° 33.425′ W. Marker is near York, Nebraska, in York County. Marker is on Interstate 80 at milepost 355.2, on the right when traveling west. Touch for map. 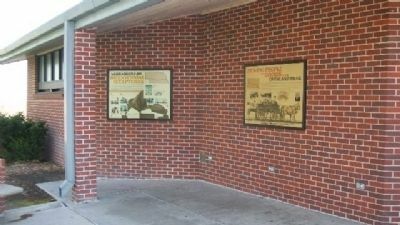 Marker is at or near this postal address: York I-80 Rest Area Westbound, York NE 68467, United States of America. Touch for directions. (approx. 10.8 miles away); Fairmont Army Air Field (approx. 12.8 miles away); Fairmont Creamery Company (approx. 13.1 miles away). Touch for a list and map of all markers in York. More. Search the internet for Moving People and Goods on the Overland Trail. Credits. This page was last revised on June 16, 2016. This page originally submitted on December 22, 2014, by William Fischer, Jr. of Scranton, Pennsylvania. This page has been viewed 355 times since then and 16 times this year. Photos: 1, 2, 3, 4, 5. submitted on December 22, 2014, by William Fischer, Jr. of Scranton, Pennsylvania. 6. submitted on December 21, 2014, by William Fischer, Jr. of Scranton, Pennsylvania.